When woodworker Glen Waller saw old wooden dam gates lying on top of a burn pile, there was no way he would let them go up in flames. They came from the Lamoille River dam in Morrisville, Vt., and the time had come to replace them with new metal gates. Even though they had been relegated to the excavator’s burn pile, Waller knew they had value and that someday he’d find a use for them. He salvaged the dam gates and stashed them in a storage unit, along with other slabs of wood he’d similarly reclaimed. 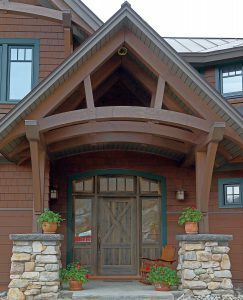 Five years later, the center-cut oak gates found a new purpose as the unique front door to a custom home by Sisler Builders. The wood had been submerged for about 80 years and look as though they’d been sandblasted by the volume of water sloshing against them. 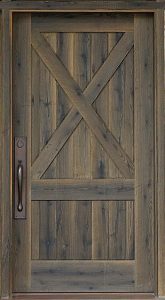 They’ve also been naturally ebonized by the reaction of the steel I-beams and rods that held the gates together, with the natural tannins in the wood. Waller removed I-beams and other fixtures before storing the gates for five years. Cushman Design Group of Stowe, who designed the house, also designed the the unique front door. “We like working with creative designers and architects like Cushman. They create the designs and the vision, they give us the leeway to design-build as we see fit, as long as their overall vision comes to fruition,” said Seth Allen, Waller’s co-worker in the woodworking division at Sisler Builders. It took Waller and Allen over 600 hours to reclaim the oak dam gates and give them their new life. The client had wanted a unique front door, and is overjoyed with the end result. 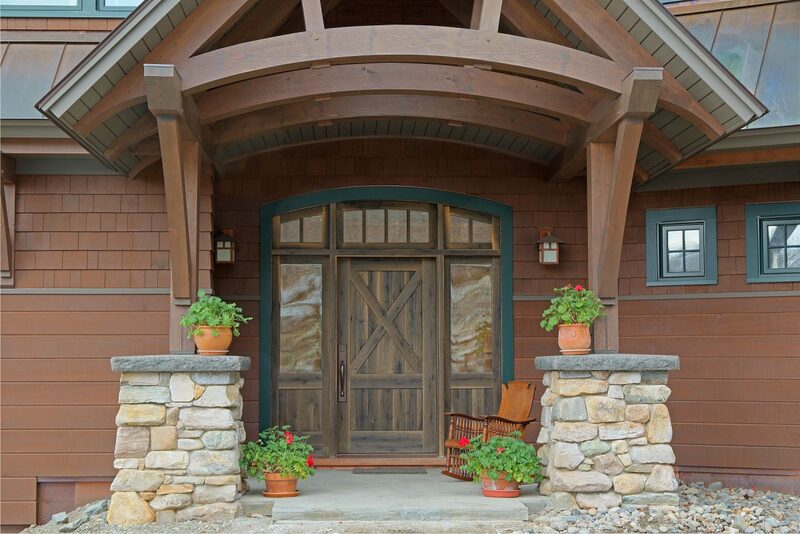 Click HERE for more about Sisler Builders’ creative woodworking division.